I'm trying to get the version number, so that I can display it in my HUD. Using one of the answer here showed me a yt-video that showed to add an own C++ Blueprint Class. Any idea whats wrong with my code? It build without warnings and errors in Visual 2015. Could you please provide the crash logs from your project's Saved->Logs folder? Could you please cause the crash again, provide your Machine ID from the Crash Reporter window, and then hit send on the window? (Assuming that you are getting a crash reporter window). Can you reproduce this crash in a clean project? Do you have repro steps we can follow to reproduce the crash on our end? please find logs attached - please delete from this post when downloaded. no, not reproducible - as it works in a clean project. So the new question is, why is my new C++ Blueprint not shown in my "All actions for this Blueprint" nor in "All Possible Actions"-right click? As you can see in the clean project, it gives a warning and the C++ Blueprint has a different appearance than in my project. Before you declare your function in your .h file, go ahead and add public: to ensure that the function can be called in other blueprints. After I did this, I was able to get the version number using your function and print it to the screen without any issue. I did, but still not able to see this in my Project. Did you try using the Project Version node instead, as you displayed in your picture above? When I used this, I was able to print out the correct version number after making the function Public. Yes, same steps as in clean project. Did you try using BlueprintCallable instead of BlueprintPure as I used in my example? Could you please zip up your project and provide me with a link to Dropbox where I can download it? I'd like to take a closer look at it to see why our results aren't matching up. Thank you. When you have the project uploaded, please post a comment on this post so that I will be aware that you have sent the link. I have attempted to download the project, but it keeps giving me an error while I am trying to download it. Could you attempt to download it using the link you provided me and let me know if you are able to successfully do so? Thank you. I sent you another link, please try. Thank you, this link is now working. What blueprint am I looking in to attempt to reproduce your issue? I can verify that I was not able to see the Project Version node in that blueprint. However, the version of the project that you sent me does not include the code you were using. Is there any way you could reupload a full version so I can see exactly what could be causing this issue in the code? 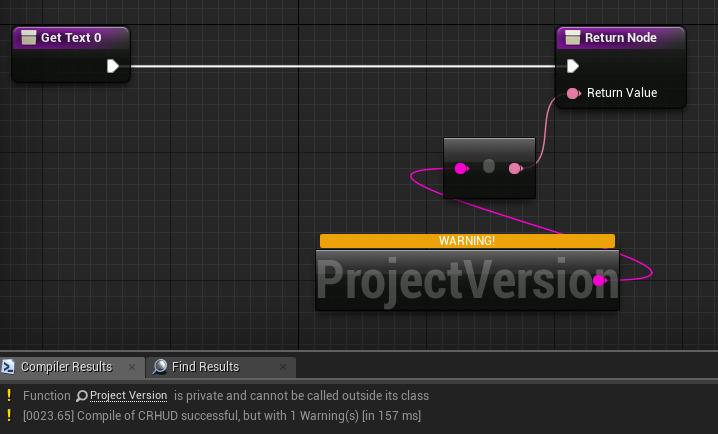 Strange, I used the zip Project from UE4 Editor to create this zip. Nevertheless, I'll create and upload a new zip file and will contact you here when done - hopefully tomorrow. Are you able to see your GetProjectVersion C++ class if you search for it in the Content Browser? If so, try making a blueprint based on that and seeing if your function shows up in that blueprint. hmm.. I made it work, but it still feels that there is an issue. but again, this still feels wrong, as I tried in other of my projects and it works without rebuilding, just "Add Blueprint C++", insert code, clean build in Visual 2015 (without closing the one or the other) and finally using. I am glad to hear that you were able to get it working. While this is a strange occurrence, it is possible that there was something that got corrupted in the project which required you to rebuild the project in Visual Studio. Are you able to see the function now in your blueprint? Yes, I can see and use the new Blueprint now. But for every new C++ Blueprint I need to do this procedure as well, so just rebuilding (once) is not the solution. As this issue has currently been unable to be reproduced in a clean project, unfortunately there isn't much else we can do. However, if you happen to see this issue appearing in other projects, or if it becomes a major blocker for you, please re-open this topic with additional repro information and I'll be glad to take another look at it. I'm having this issue or something very similar to it. 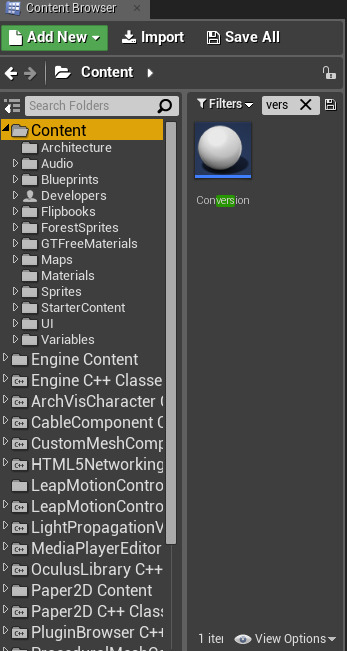 I ported my project from 4.14 (From epic launcher) to 4.15(From source + PS4) and now every time I try to do anything with a blueprint who's base class is in c++ the unreal editor crashes.